Last week, I saw Humor Abuse at the Mark Taper Forum in Los Angeles, and it was honestly one of the most delightful, creative and captivating shows that I have seen in a long time. Humor Abuse was created and performed by the incredibly charming and talented Lorenzo Pisoni. This is an autobiographical one-man show about growing up in San Francisco’s Pickle Family Circus and about his famous clowning parents who allowed him to join the family business at the age of six. Lorenzo earned his clown stripes through on-the-job training with his domineering clown father as his role model, guru and comic foil. 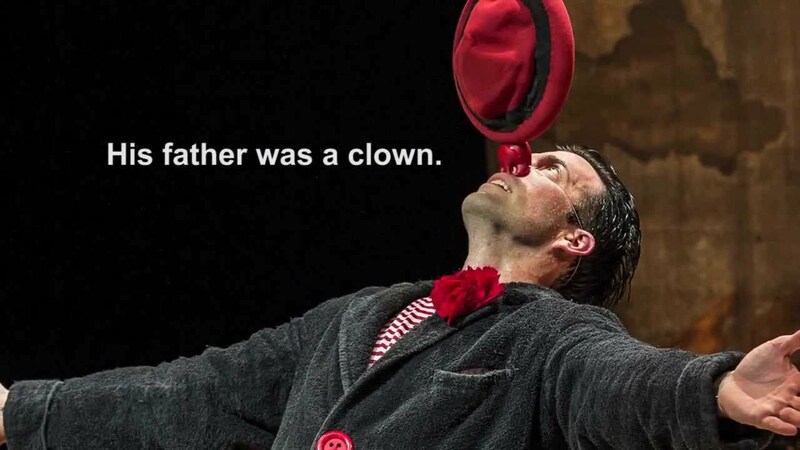 Pisoni tells his riveting, funny and heartwarming tale while performing side-splitting physical feats like juggling, balancing a hat on his clown nose, falling down stairs and dodging sandbags to name a few of the show’s memorable highlights. He is masterful at mixing heart and humor while tenderly paying homage to the consummate performer, parent and perfectionist who taught him everything he needed to fill some very big shoes. I was captivated by this intriguing tale that Lorenzo told and performed for a full 90 minutes without intermission. I was enchanted by being treated to an inside glimpse of the business of clowning, learning about how Lorenzo was “abused in the name of humor” and mostly just in awe of how much skill and physicality it takes to be a good clown and how he learned this lost art from his father. It was so darn interesting to get inside the mindset of clowning which allowed me to understand and appreciate all the dedication and training that goes along with it, and it all honesty I never gave it a second thought, until now. I adore shows that take me on a journey to another place and time, sucking me into to it’s story, entertaining me and opening up my mind to new insights and possibilities. But perhaps the best part, is that a show like this leaves an indelible impression on the internal Playbill of this theater buff (meaning that this is one of those plays that I will remember for a long time to come!) I LOVED it and highly rec that you grab some last minute tickets before it’s too late. It’s a must-see GEM!